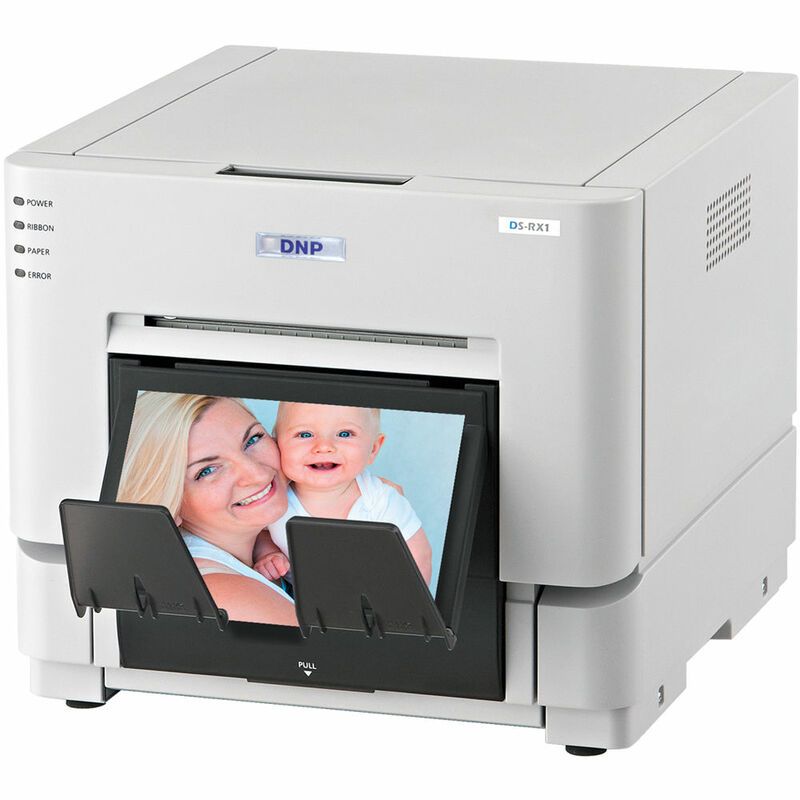 The RX1 Photo Printer from DNP features a compact design (12.6 W x 11.0" H) ideal for photo booth applications. The printer outputs 300 dpi photos and takes just 14.9 seconds to print a 4 x 6" photo. The printer can output the following photo sizes: 2 x 6", 4 x 6", 6 x 8". Both glossy and matte papers are available. Despite its compact size, the printer is still able to output 700 photos sized 4 x 6" in a single run. Box Dimensions (LxWxH) 22.7 x 18.4 x 17.3"
RX1 Photo Printer is rated 4.5 out of 5 by 49. Rated 4 out of 5 by Alan from Dye Sub Printer I use the RX-1 printer for events mainly in my photobooth. It is robust,light weight, really quite, easy to load paper & ribbon and compact. I would have given it a 5 star but the printer doesn't show how many prints are left on the roll like the Shinko 2145. But my way around this is I mark down how many prints it uses after each event and then just add them up to see where I am at. But the media is cheaper,by $80 per 1400 sheet roll. I think since it processes the prints faster, I think it prints the same or faster than my Shinko. I am selling my shinko and using all RX-1 printers. Rated 4 out of 5 by Portraiture By Jai from Perfect printer for photo booths! I purchased the DS-RX1 for two reasons. 1. My photo booth and 2. event prints. This printer works perfectly for those two things. It is very fast, colors are great and my guests are all happy. The price per print also helps me keep my rates down as well. The only things that I'm not exactly in love with are the size, thin paper media and the darn thing is pretty loud. One other thing is that the unit requires this special foam piece to be inserted to protect itself while moving the unit. Not a huge deal but it does get annoying as I do move it around a lot. Rated 5 out of 5 by David B from Great printer As usual, I did a ton of research before buying this. Using it for an open air photo booth for weddings and events. It's very straightforward. Out of the box and working in about 30 minutes. The print quality is great and dye sub is the way to go for these events. Couldn't ask for much more! Rated 4 out of 5 by elbtsi from So Great... I would highly recommend the DS-RX1 to anyone who is wishing to print their own photos. The only reason I am giving it a rating of 4 stars is due to the weight of the machine. Whether they are a pro photographer, a photo booth owner, or anyone just wanting to print their photos at home. At only $ per 4x6 photo, you really can't beat the price. As a photo booth owner, I HIGHLY recommend this product. Rated 5 out of 5 by Amber D. from Great Printer We have only used it at two events so far but love it. It sets up quickly and the print quality is great and the speed is fast. I also love that it cuts the 4x6 images into 2x6 strips. saves a lot of time. Rated 5 out of 5 by All Star Photobooths from Great workhorse This is the second RX1 I've bought. It's great, couldn't be happier with the simplicity, cost and easy of use. The 700 print capacity is great since I do booths at mostly weddings and school dances where I'm running a few hundred per night. Knowing I won't have to change it before opening up for a 800 student dance is great. Highly recommend. Rated 5 out of 5 by jalojado from Love this printer!!!! Produces great prints for my photobooth in 15secs. Color and quality is perfect. Printer is compact and easy to transport. Great addition to my small business. We just purchased this from you, and wondered how we get a matte surface? It would be in the settings, you would be able to choose a Matte finish. The printer would print it that way, you would not need a different media for it. Is it compatible with Android? Can I print directly from Android? Unfortunately, this printer is not compatible with mobile devices that use the Android operating system. Can I print directly from my camera? In the DNP settings you do have the option to see this, as well as in the latest's Windows 10 software updates. You can see it in your printer settings. The printer is supposed to print both glossy and matte prints. Do the DNP roll kits have matte or glossy finish? I can't get the printer to print the right direction for the photo paper, it keeps printing perpendicular to the paper.How do I change settings to get it printing correctly? You will want to work with your settings. There should be a settings or print properties from the window where you would enter the quantity you want to print. Switch btw landscape/portrait settings or just trial and error. The DNP DS-RX1 Dye-Sub Color Photo Printer is compatible with Darkroom. As for computers, you can use any computer running Windows XP, Vista, Win 7 and Win 8. 32 or 64 bit. How can I buy A guide rail set for 5x7 size printing? The RX1 does not support 5x7 printing.